FAQ: Trust the Services of Suburban Solutions! Though there are many choices for moving companies Philadelphia PA residents often choose Suburban Solutions. Anyone in need of assistance with packing, moving, junk removal or cleaning can benefit from the services of our quality professionals at Suburban Solutions. Since starting our business in 2010, we have helped ease the process of moving for our fellow community members. Below are answers to some of the most common questions our clients ask. Please don’t hesitate to contact us for more information about Philadelphia moving companies and how we can be of service. Packing Is Too Stressful, What Can I Do? We can do all the packing for you. You can feel confident that we will take great care with each and every belonging. Our crew is experienced and specially trained to handle the most delicate of items as well as the heaviest. When it comes to moving companies Philadelphia PA professionals as well as homeowners choose Suburban Solutions. Rest assured knowing we will pack all your belongings to prevent damage. We may be able to offer you same day pack and move services. Boxes come in all sizes and we can provide you with boxes specific for wardrobe or odd-sized items. Our team uses quality packing paper, bubble wrap, tape, and padded moving blankets. Local: whether you’re moving your belongings just down the street or to the other side of town, we can get your belongings there safe. Long Distance Move: these services extend to the contiguous 48 states, and our personalized service will ensure you feel confident having us move your treasured belongings no matter how far they’re going. Sub-Solve Express: there is a major difference between hauling a multi-level home and a single bedroom apartment. For those who live in an urban area, we created a quick and efficient way of moving your things city-to-city. Of the many choices for moving companies Philadelphia PA families trust Suburban Solutions. Commercial Moving: moving an office may not be possible during work hours, so we will coordinate when and how to minimize disruptions to your business. I Have a Huge Pile of Junk, Can You Help? Of course! We can understand the feeling of wanting to remove junk from your property as soon as possible. Contact us for an estimate. In an effort to recycle as much as possible, we will donate everything we can to our local Goodwill Center. Everybody wins! 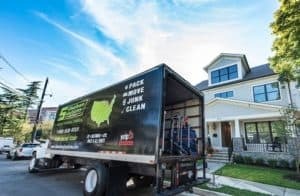 Can I Get Cleaning Assistance from Moving Companies in Philadelphia PA? Not all moving companies Philadelphia PA locals recommend are also trained to clean. In fact, we specialize in move-in and move-out cleaning services. We offer many cleaning packages depending on your needs. At Suburban Solutions we understand that life can get hectic, particularly in advance of a move. If you would like to take advantage of our cleaning services before or after your move, let us know. We can clean your home or office in addition to any special requests such as deep cleaning your oven, cabinets, refrigerator or even performing drywall repair. Please do not hesitate to contact us regarding your moving needs at either info@suburbansolutions.com or 1-888-Sub-Solv. We look forward to hearing how we can meet your moving or cleaning needs. Call us first when you’re considering moving companies Philadelphia PA offers.